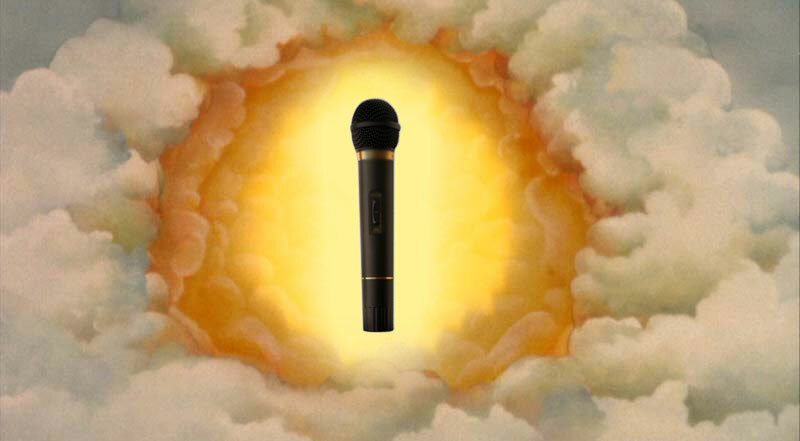 Wireless microphones that perform well are the Holy Grail in worship spaces. With Palm Sunday, Passover, Good Friday, and Easter just around the corner, the sound-systems in our churches and synagogues can be the un-sung heroes of the week, or the albatross around the necks of anyone holding or wearing them. We’ve all come out of a worship service remembering when the mics didn’t work, and we couldn’t hear the message. How many wireless mics does your church really need? How can you be sure they will work? How much should you pay for a wireless microphone? When planning for the number of wireless microphones, it’s important to keep in mind that a wireless microphone is really only replacing a short cable. A wired microphone needs to reach from the microphone to the ground, or to wherever you plug in. Cables can be fairly inexpensive (about $7) and are easy to replace when they break or wear out. If a microphone is going to be on a stand, or the singer or speaker is just going to stand there, you probably don’t need a wireless solution. Think through how those microphones are actually going to be used. You might only need one or two for your worship services. Cutting down on the sheer number of wireless devices not only saves money, but helps them all work better. Getting microphones to work the way you want them to can seem elusive, but poor performance is usually the result of interference. Just about everything creates some sort of wireless interference these days. Mobile phones, WiFi networks, laptops, tablets, other wireless mics, transmitters/receivers, microwaves, appliances, cars, power lines, and even people in the room can create Radio Frequency (RF) interference. If you were going to use a wireless microphone in an un-populated area, with few sources of interference (including no other wireless microphones) a basic $300 option might work well. However, if you have people sitting in your church, and if any of them have mobile devices, or you have additional wireless mics, the $1,000 option is going to do a better job of filtering out the RF noise. The more expensive microphones also use a digital signal, allowing for more channels within a single digital frequency. So when can you reliably chose a less-expensive mic? Put simply, if you’re comfortable with your wireless microphones failing more often, you can spend less on them. Acoustics By Design can help you choose the right equipment for your needs. When the AVL consultants from Acoustics By Design work with you to design your sound system, we take into account your wireless microphone needs. We help you evaluate how many you need. We watch your budget along with the potential sources of RF interference. Designing a system is more than just choosing locations for loudspeakers, and picking a mixer off the shelf. Our knowledge and experience helps you get a system that works the way you want it to. When a technical system, including audio, video, and specialty lighting, designed along with room acoustics, provides the best sounding space for your ministry, people won’t notice. They’ll remember the message instead. You’ve just finished replacing all your microphones because the FCC restructured the frequencies your old mics were using? Guess what, they’ll do it again. Agreed! For the average attendee of a service the technology used should function in such a way that it is transparent in its supporting role of delivering the message. However, I’ll have to admit that being tech-heads you and I probably share the same “curse” of never being able to fully disengage from the innate awareness and analysis of the systems being utilized and the corresponding quality of the presentation. As you say, microphones are only one part of the overall integration picture. Of course, having great gear does not guarantee great performance. How it is applied is another huge piece.